Radio Cuba Canta takes a historical look at Women in Cuban Music. From Rita Montaner to Maria Teresa Vera, Celia Cruz to Celeste Mendoza, Orquesta Anacaona to Camerata Romeu: listen to the many diverse sides of the music of Cuba in which women have and continue to play an important role. This tradition continues today with the many young female soloists and ensembles heard today, not only in Cuba but throughout the world. So Tune in, tonight on KPFA-FM 94.1 or www.kpfa.org. Tonight’s Cuba Canta is a historical look at women in Cuban music. From Celia to Maria Teresa: listen to the many diverse sides of the music of Cuba in which women have and continue to play an important role. This tradition continues today with the many young female soloists and ensembles heard today, not only in Cuba but throughout the world. So Tune in, tonight on KPFA-FM 94.1 or kpfa.org, from 9:00PM till 11:00 PM Pacific time. Engineer C’Tone at the controls. Emiliano Echeverria celebrates his 40th Anniversary broadcast on KPFA FM, spinning vintage, rare and contemporary Cuban music recordings. Guest host for Con Sabor: Emiliano Echeverria hosts the monthly installment of Cuba Canta on KPFA FM. Thanks to Luis Medina, host/executive producer of Con Sabor. Con Sabor guest host Emiliano Echeverria celebrates his 40th Anniversary as a KPFA broadcaster with Cuba Canta, bringing his collection of vintage, classic and rare Cuban music recordings, from Danzon to Son, Mambo to Doo-wop, Timba, el Rap, and Regetun Cubano. 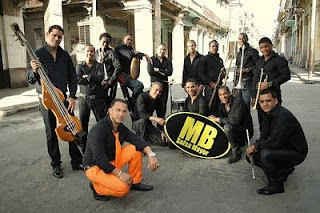 Featured artists include: Orquesta Aragon, Machito and his Afro-Cuban Orchestra, Miguelito Valdez, Orquesta Riverside, Estrellas Juvenides, Charanga Tipica Cubana, Conjunto Casino, Rene Alvarez, Los Papines, Los Zafiros, Angel Bonet, Charanga Habanera, X/Y/S, and more. Special guest includes SF-based attorney and cultural presenter Bill Martinez discussing the current state of US-Cuba relations, travel and musical/cultural exchanges. Engineer Clay ‘C-Tone’ Leander at the controls. Guest host for Ritmos de las Americas: Emiliano hosts the monthly installment of Cuba Canta on KPFA FM.